I have never seen Lesser's in Idaho, much less my own neighborhood. They are reported regularly in Idaho, I just haven't come across them until now. 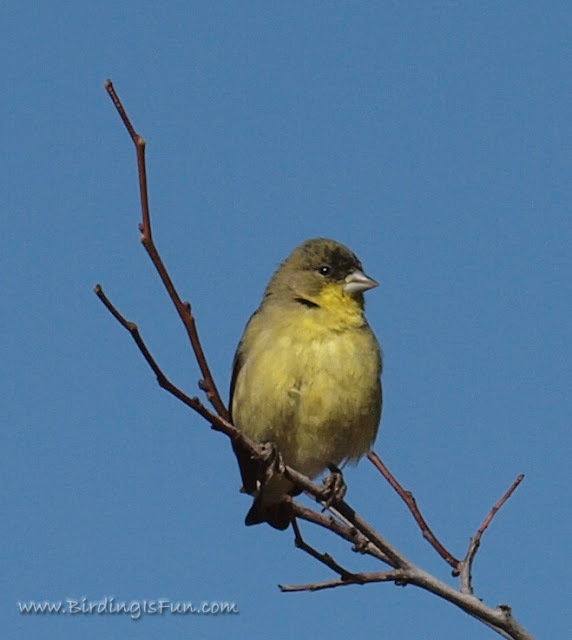 Back in my Arizona days, Lesser's were the only type of Goldfinch I'd get at my feeders, but they sure looked different in full breeding plumage as compared to the those I saw this day. So, how can you tell the difference between a Lesser and an American Goldfinch? Good question! My first clue on these little guys was simply my gut instinct about overall shape, size, and sound...and the fact that they were so different than the American Goldfinches all around them. Studying the photos, you can see a few more clues. On the top photo, that little strong white patch on the male's wing (at the base of the primaries) is a good differentiating characteristic. The olive green upper parts and nape help too. The developing black forehead helps. American's get black foreheads too, but none of them show any sign of this black forehead during this time of the year. I need more field marks to clinch this identification. 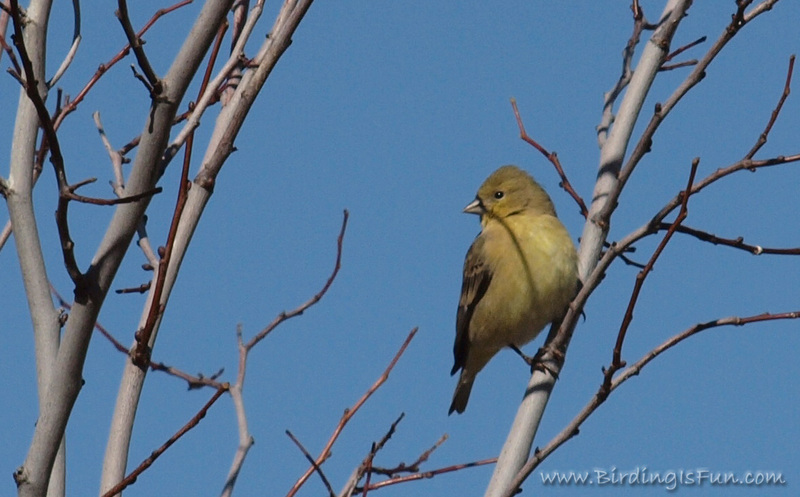 Lesser Goldfinch have yellow on the underside of the tail, while American's have white. Look back at the previous post of the American's and you can see a dramatic difference in the tail feathers. In flight, the Lesser Goldfinch has white underwing patches and again the tail is different than the American Goldfinch. 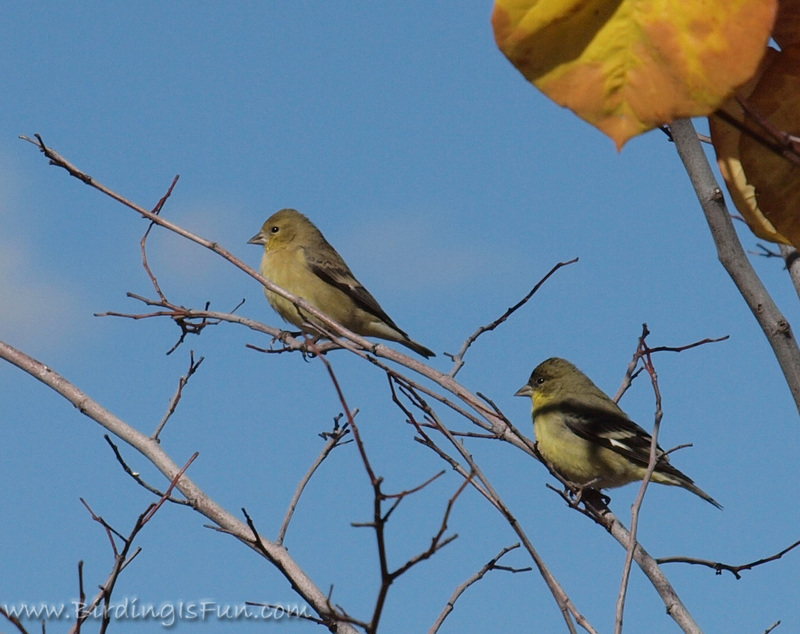 What other clues can you suggest for telling the difference between Lesser and American Goldfinch? Looks like you've covered all the differences I know of. Great Post! Are you really moving to the east coast! What a coincidence! I am up to 388 life birds and hope to add more while I am here! I will have to read more to see if I can catch up with all you have been up to! Must be hard to leave Idaho but you are right, you will get to see a whole new variety of birds! I wish you well! Who knows, perhaps one day we will meet! Your bird photos are stunning. The Lesser Goldfinch is stunning, and your photos. And ..like Kathie said..are you moving to the east coast? what cha doing back in Idaho? I don't think Lesser Goldfinches have been recorded in CT but I should pay closer attention to the American Goldfinches-you never know. .